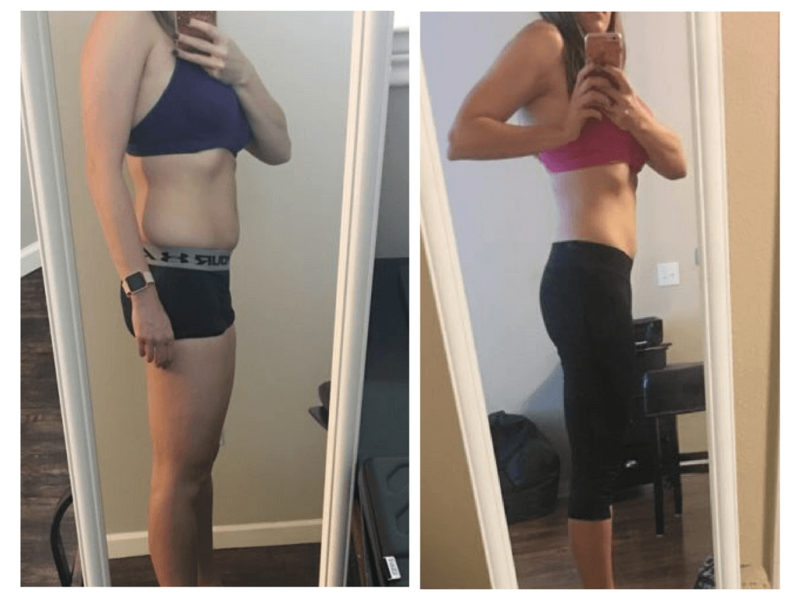 Rachel lost a significant amount of weight in just a few months, but more than that, she dropped numerous inches off her upper, middle, and lower body and even built lean muscle in the process! Mark lost a crapload of fat...Like, a lot. Through his hard work and consistency, he's taken it one step further and built a rock-solid physique which he's been maintaining ever since. When Whitney and I started working together, she was seriously struggling to make notable progress despite the fact that she was dieting and exercising religiously. After a couple of dialing in her nutrition and workout routine, she was finally able to get rid of her stubborn belly fat, build muscle, and achieve the strong & toned body she's always wanted. And the best part is that she was able to accomplish ALL of her fitness goals without giving up her social life (which she cherished). She continued going out for drinks with friends throughout the entire process! Why am I sharing these success stories? 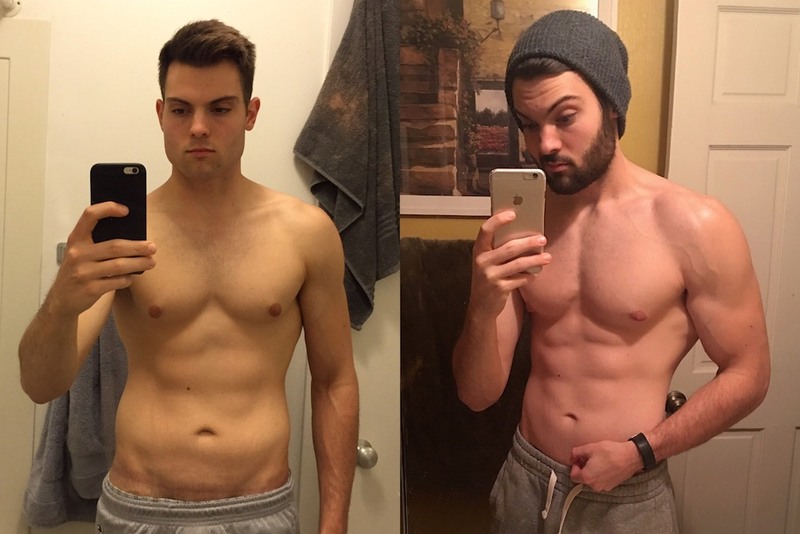 All three tracked their journey - they tracked their food, their body stats, their workouts, and even their mental state throughout the entire process. If you’re serious about taking control of your body and losing fat once and for all, then tracking your progress is a MUST. I'm talking about keeping track of multiple different body stats as well as your diet and exercise routines. If you've been struggling to see changes on the scale despite working tirelessly on achieving your goal, then you're in luck! In this article, I'm going to outline everything you need to know about tracking your journey and fitness progress so that you can get the body and health you've always dreamed of having! 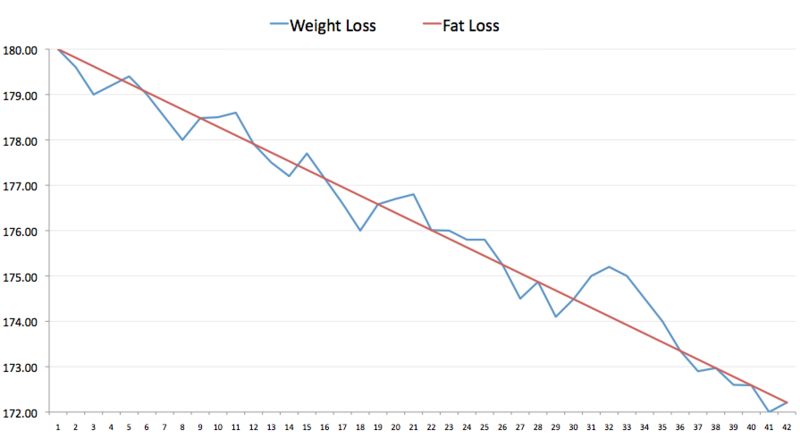 The scale shows your weight dropping every day for the first couple of weeks, which is awesome. You get upset, fall off the wagon, and end up binge eating raw cookie dough in the late hours of the night. Unfortunately, this tends to be the story with 90% of people trying to lose fat and achieve their dream body. Everything's sunshine and rainbows at first, but then something happens–they accidently overeat one night, drink one too many cocktails, serve a second helping of dinner–and their weight shoots up. Heck, sometimes their weight shoots up despite the fact they're following their exercise and diet regimen flawlessly. Whatever the reason, because they've relied solely on the scale to gauge their progress, their spike in weight motivates them to either increase the intensity of their diet and exercise (often to unsustainable levels), or they simply quit. Either way, they end up right back where they started. You may not realize this, but there are literally hundreds of things that can cause your scale weight to fluctuate up and down. Most of which have absolutely zero to do with gaining or losing fat. Did you weigh-in at the same time of the day? Have you had anything to eat or drink? Did you have a lot to eat the night before? How much sodium did you have the previous day and meal? Have you gone to the restroom yet? Are you wearing similar clothes? Where are you at in your menstrual cycle? Did you drink alcohol yesterday? Are you more stressed than what's usual for you? Are you using the same scales that you always use? 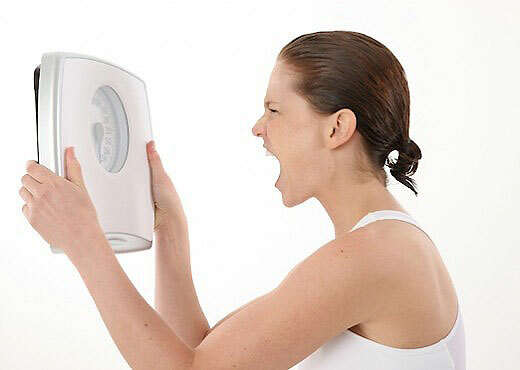 Are your scales on the same surface every time you weigh-in? *Note: It's not that eating carbs magically leads to gaining fat, but rather they cause the body to store water and glycogen - both of which can effect scale weight. If you wanted to keep your daily weigh-ins as consistent as possible, you would need to make sure that all of those factors (and probably more I can't think of while writing this) are kept constant. Obviously, trying to micromanage every single aspect of your life isn't reasonable, nor is it a realistic approach. Want to know something crazy? I was the EXACT SAME WEIGHT in both pictures - 171 lbs. You see, not all weight is "bad" weight. 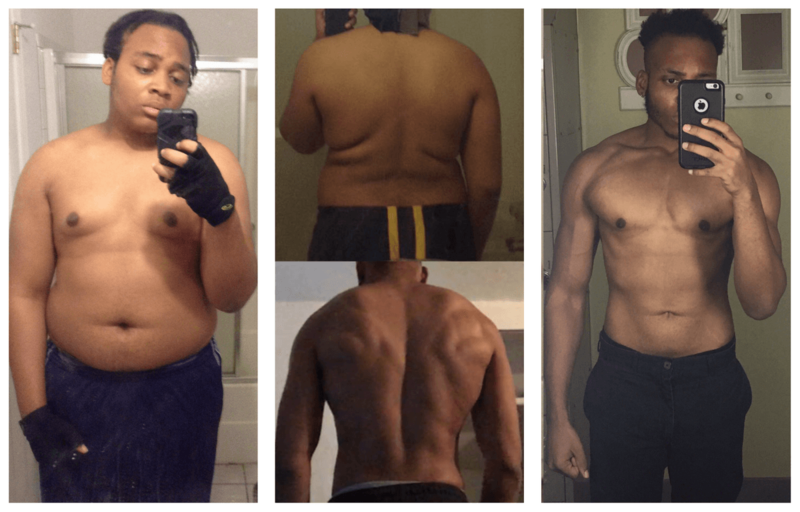 Because I had my diet and training dialed in, I was able to both lose fat and building lean muscle mass despite hovering around the same body weight. This is one of the main reasons I'm such an advocate of strength training while dieting. Although your scale weight may not drop as fast compared to starving yourself and running 20+ miles a day, the weight you do lose from strength training will be almost entirely fat and not muscle. Unfortunately, folks who neglect resistance training and focus solely on losing scale weight typically end up looking "skinny fat" (often characterized as appearing thin in clothes but with extra fat around the mid-section). One of my coaching clients, Amy, has had a similar experience with making non-scale weight progress. In the first few weeks together, she didn't lose a single pound of bodyweight. However, when she took her body measurements, we found out that her body measurements had gone down a total of 6 inches! They Aren't Tracking Their Workouts - Do you go to the gym and mindless wander from exercise to exercise without much thought? Starting a strength training program is a great first step, but you also need to make sure you're tracking your workouts to ensure you're progressing each week to build strength and muscle. They Aren't Tracking How They Feel - You could follow the best diet and exercise routine in the universe, but if it causes too much stress, it'll only be a matter of time before you give up or give in to temptations. While all diets will cause some degree of hunger and energy deprivation, it should never get so unbearable that you can't sustain it for more than a few weeks. By this point, I hope that I've thoroughly convinced you of the importance of tracking. As the saying goes, "what gets tracked, gets managed." 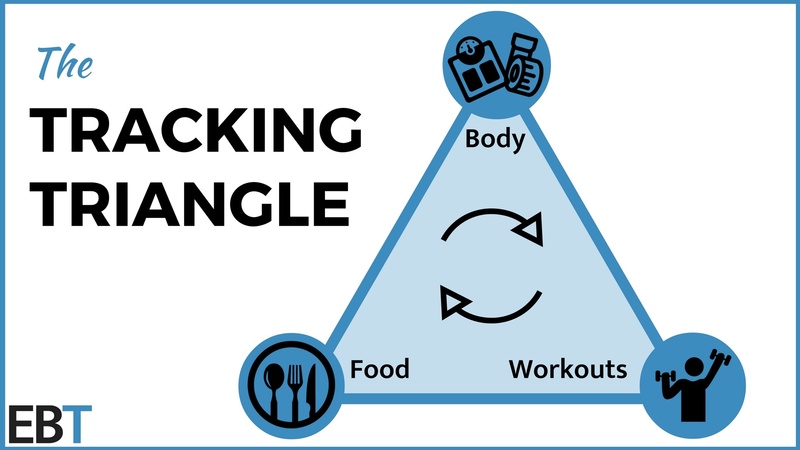 The Tracking Triangle (see above) includes the 3 points of progress that I have each and every client monitor to ensure they're getting quick and consistent fat loss results. To start, know that you should never analyze and compare your body stats on a day-to-day basis. Your body is an incredibly complex piece of machinery with thousands of systems, many of which lead to weight fluctuations each day. When you're analyzing your progress over time, focus on the changes you're making weekly, bi-weekly, and monthly. "Wait, didn't he just spend the first third of this article bashing the body scale?" But when the body scale is used correctly, and alongside other forms of body stat tracking, it can actually be a handy tool for assessing your progress. The key words, though, are "used correctly." We've already discussed the mistake of comparing your day-to-day weigh-ins, but another common mistake is looking at single, once a week weigh-ins. The issue with comparing once weekly weigh-ins is the same problem of daily weigh-ins - it's hard to tell if your weight change is due to fat or from body fluid/content fluctuations (remember the long list from the previous section). The solution to this is actually quite simple. All you have to do is combined the two by taking daily weigh-ins and comparing them weekly using weekly weight averages. Weight yourself every day and write the number down. Remember, you shouldn't worry about the number you see at the time of weighing. At the end of the week, take all seven of your weigh-ins, add them up, and divide that number by 7. This will give you your weekly weight average. Repeat those two steps for at least 4 weeks. Once you have all of the data from those three steps collected, you'll be able to accurately analyze and compare your weekly weigh-in averages to see if you're progressing in the right direction. Along with using weekly weight averages, you should also monitor the changes to your body circumference measurements. I have most of my clients take all of their measurements–neck, shoulder, chest, arms, waist, hips, thigh, and calves–once every two weeks. But at the very minimum, I recommend you take two measurements every 14-21 days. If you are doing it yourself, you may want to purchase a self-measuring tape like THIS ONE for ease of use and more accurate measurements. 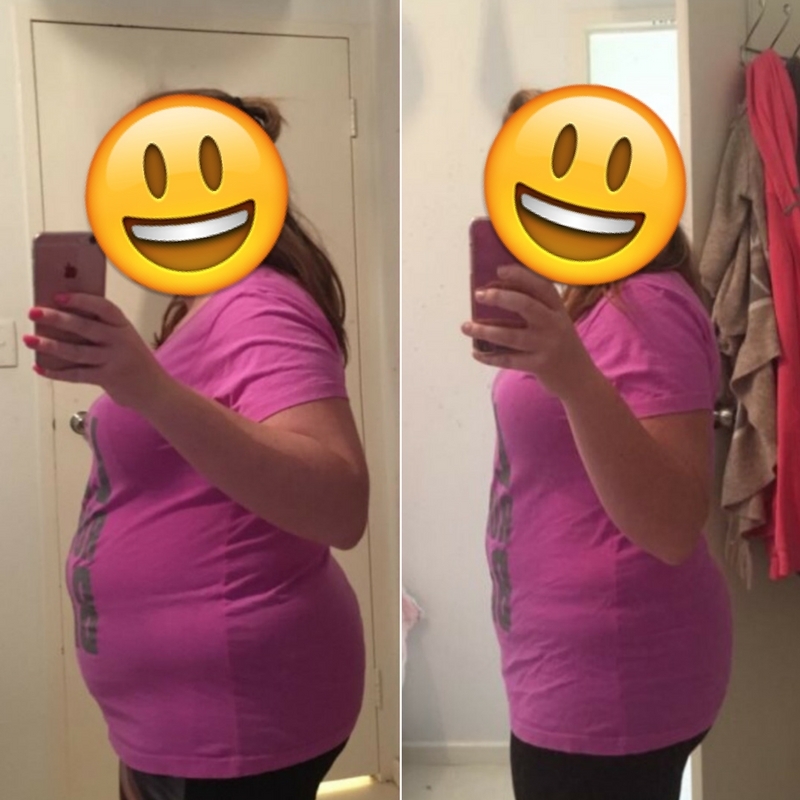 Progress photos are by far my favorite method for tracking physical progress and changes. Sure, watching a few data points change over time is nice, but it's nothing compared to the motivation you get from seeing positive changes in your physical appearance! Since we see ourselves every day, it's difficult to notice small changes from looking in the mirror. But with progress photos, you'll have snapshots from different points in your journey that'll make it easy to see body changes taking place. After 3-4 months of working with a new client, I always like to show them their "before and after" photos. Most of the time, they're completely shocked by the amount of progress they've made without even realizing it! Wear a bathing suit or similar attire. Now, I understand that some people might find taking half-naked pictures in the mirror somewhat uncomfortable. Do they know how many calories they're eating? How many times do they eat? And how much? Do they monitor their portion sizes? Do they eat plenty of fruits and veggies? Are they getting enough protein? If the answer to any of those questions is "I'm not sure?" or "maybe? ", I know that there's probably something in their diet that is causing them to struggle which needs fixing. I'm a fan of tracking calories and macronutrients, but while some people love tracking and measuring their food, others loathe it. Either way, I believe everyone should spend some time (at least ~6 weeks) tracking their food intake in some fashion. If you absolutely hate tracking, at the very least I suggest figuring out your calorie needs for weight loss and then creating a meal plan around those targets. This way you can just eat the same meals and know roughly how many calories you're getting each day without tracking religiously. Do you know what exercises you're going to do? Do you know how much weight to use? Do you know how many reps to aim for? Do you write down how much you did so that you can look back and make improvements the next workout? ...or do you mindless hop from exercise to exercise and do what sounds fun on that particular day? When you're just starting out, you can get away with doing random exercises with random weights and reps. However, this approach quickly turns into a one-way ticket to plateau city as your gym and fat loss progress stall out. Instead, you should be working out with purpose. Working out with purpose means following an effective strength training routine, tracking your workouts in a notebook or phone app, and making consistent progress each week. 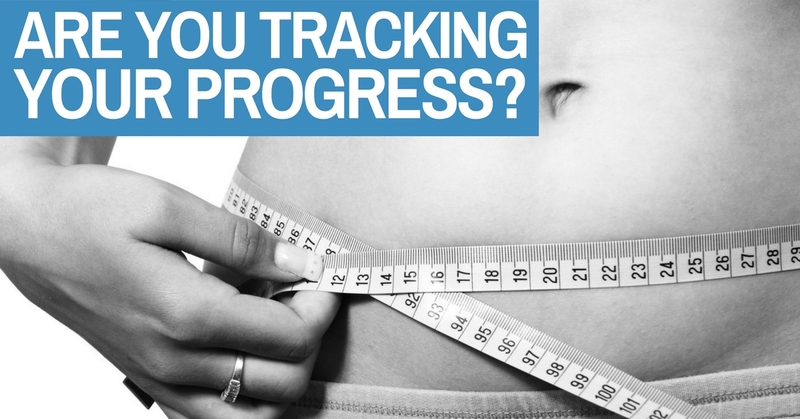 How seriously you track your progress will dictate how seriously (and quickly) you get results. And now that you know the importance of tracking, I bet you're hankering to find a diet and workout plan that's going to allow you to apply this newly obtained knowledge, aye? Don't worry - I gotcha covered!